Readers are invited to visit the author's comprehensive research project titled "The Silvan Reservoir - a Pictorial Heritage - 1880 to 2011" . This describes the history, development, construction and operations of the Reservoir in detail - much of the Silvan content of this present O'Shannassy Project has been sourced to the Silvan Project. The names "Silvan Dam" and "Silvan Reservoir" refer to the same thing. Early documents and images show "Dam" - later works show "Reservoir. The final major phase in the O'Shannassy project was to be the construction of the Silvan Dam, near Mt Evelyn. This had been planned from 1916 as a storage (holding) reservoir for the O'Shannassy system, particularly to hold water from the aqueduct and provide a back up storage in times of extreme drought, such as that in 1914. It would also act as a settling basin to further ensure the quality of Melbourne's drinking water. The site was selected in 1919 and the 442 hectares of Crown Land plus 449 hectares of freehold land was vested in the MMBW. The site was conveniently close to the O'Shannassy aqueduct so that both inlet and outlet channels would be as short as possible. Pipelines from Silvan would carry water to Surrey Hills reservoir and from there be distributed to the higher eastern suburbs of Melbourne. 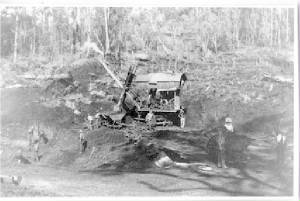 It was decided to construct Silvan using day-labour and "modern" machinery, building on the success of this approach used at the earlier O'Shannassy Dam construction. Works began in 1927 and the project was finally completed in 1930 at a total cost of just over 500,000 Pounds ($1 million). In 1917, following a severe drought, a site in Silvan was selected across the Stoneyford Creek (a tributary of Olinda Creek) for extra water storage for Melbourne. The Silvan Reservoir (a major dam across Stoneyford Creek adjacent to Stoneyford Road and two small dams adjacent to McCarthy Road and adjacent to Monbulk Road) with a storage capacity of 40,000 megalitres, completed in 1932. An aerial ropeway was constructed from a special siding at Mount Evelyn railway station to the southwest end of the reservoir wall site, a distance of about 5 km, to convey the sand and cement in 100 buckets needed for the wall construction. The railway siding was at the back of what is now Bowen’s timber yard. The Diversion Aqueduct, mainly open channel leading from the original O’Shannassy aqueduct near the Wandin Yallock Primary School to a tunnel under Silvan township, to feed water into the newly constructed Reservoir. Note: The DIversion Aqueduct remains operational to the present day, as a secondary inlet to the Dam, delivering some 8 megalitres/day from the Corronderk Aqueduct, Don Rd, Launching Place. The Outlet Aqueduct from the Silvan Reservoir to feed water back into the existing system. Mainly open channel, now known as the Mt Evelyn Aqueduct, becoming a concrete tunnel under Monbulk Road, surfacing near Ormeau Road and the (now) Melba Centre, there joining into the original Aqueduct. An increase in capacity of the existing system downstream of the point of entry from Silvan Dam. Flow of water was maintained during the widening by using temporary pipeline which was mostly above ground and took short cuts instead of following surface contours. Generally, one side and the floor of the original concrete channel were removed, the channel was deepened and widened and then re-concreted. Where the original aqueduct was in pipe, an extra pipe was laid. The health concerns accompanying increases in population caused the open channels to be replaced by pipes to and from the Silvan Reservoir by the late 1960s. Enclosed pipes had no need to follow surface contours, and new shorter routes were adopted. 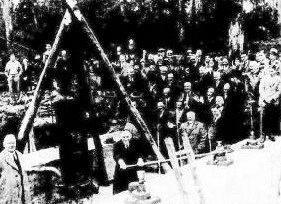 The dam was officially opened on 7 July 1931 (by which time it was almost three-quarters full). Total capacity was 40,000 megalitres. The main dam wall was 644 metres long at its crest, 219 metres wide at its base and 43 metres high. The wall required 46,000 cubic metres of concrete and 1.3 million cubic metres of earthfill. The cellular core wall principle was almost entirely new and represented a notable advance in the construction of large earthen dams. The foundations of the core wall extended up to 140 feet (42 metres) below natural ground level. All of this was absolutely "best practice" at the time. The scheme provided a model for future Board projects involving the use of the latest technology (replacing much manual labour and horse-power), efficient use of day labour and the purchase of its own plant and equipment. The project actually came in several hundred thousand Pounds under budget and was hailed a great success! Silvan was fed from both the O'Shannassy and Maroondah aqueducts (from O'Shannassy Weir and Graceburn Weir respectively). 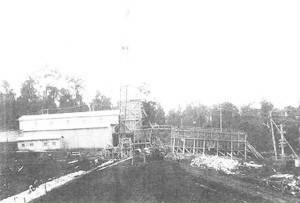 In 1933 parts of the Mt Evelyn section of the O'Shannassy aqueduct were widened to increase its capacity. One side of the concrete channel was removed, the channel was deepened and widened, then re-concreted. Piped sections of the aqueduct were also duplicated to further increase flows and to maximise the benefits now available from Silvan. With the completion and commissioning of Silvan, all three principal components of the O'Shannassy aqueduct system were now complete: O'Shannassy Reservoir, the aqueduct and Silvan Dam. The system was later supplemented by the construction of the Upper Yarra aqueduct, which was commenced in 1929. In 1936, after more drought conditions, the Board reported that Silvan "has been a tower of strength in maintaining the supply of water under these unusual conditions" and without it Melbourne would have been almost without a water supply.